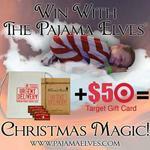 Home » Shopping & Reviews » Have you got Pajama Elves? Our family already enjoys the Christmas Elf tradition where an elf visits your home in the lead up to Christmas and gets up to tricks, funny stuff and general festive fun. 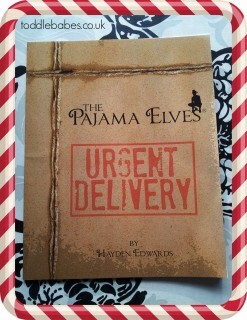 So imagine my excitement when I heard about Pajama Elves! The Pajama Elves is the magical story of the North Pole elves who sew special Christmas eve pajamas to help children sleep well on Christmas Eve. The story is written as a rhythmic poem which is always appealing for young children and makes the reading out loud that much more fun. They sneak into your home and measure up your child as they sleep in preparation for making them pajamas which are delivered in Christmas eve boxes or bags. The idea is that you create a gift box or bag for the Elf to leave for the children to open on Christmas Eve. Suggested items to include are: sweets, a Christmas DVD, a Christmas book to read together, the magical Christmas Pajamas with the special labels sewn in, hot chocolate mix, slippers, etc. The storybook does not force you to create a Christmas Eve box or bag, but rather allows you other options like leaving it for you child on their beds or under a pillow. You can purchase the labels separately to sew into pajamas you have bought to help make this magical experience even more real. This is what they look like, cute huh? The illustrations are a blend of real photographs and other images to convince your child of the Elves visits. I have children aged 4-8 and they all loved it. They are so excited that the Elves will be bringing their Christmas pj’s this year. (I was already doing this and they knew it was from me so are used to getting Christmas pj’s). Knowing that the elves are making them this year has added an extra magical sparkle to getting them. I also like that my children will know that if they get their magical pajamas on Christmas eve that they have made it onto the good list and that Santa WILL be visiting. For your own copy of this lovely book, hop on over to www.pajamaelves.com and place your order today. 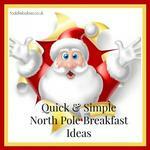 This is definitely a superb addition to our family Christmas traditions! 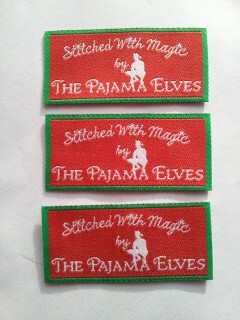 To like or follow Pajama Elves, click on the buttons below.